The purpose of the homepage is to direct and maintain a customer's 'buying momentum' - to maintain the micro-actions the viewer takes in their journey, ideally leading to a bigger action (like a purchase). Displaying products - and/or groups, brands, categories, and other special categories - on your homepage helps customers to understand the scope of your business, navigate users, and drive sales. This article will help you to show off your products on your homepage. From your ShopRoller account, click on SHOP in the top left-hand corner to see your storefront. 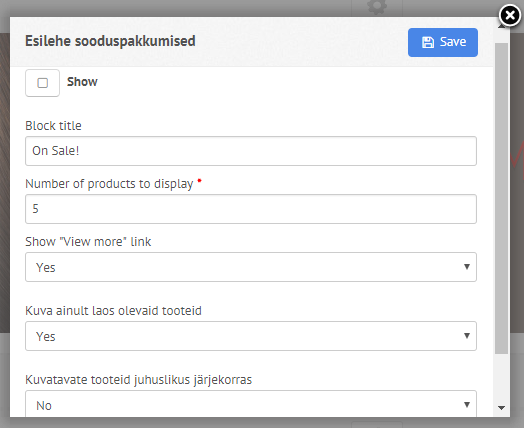 This is where you can add products - and text content - to display for your customers. Click the icon in the row you wish to set, to bring up the display settings. Select the settings icon of the product display you would like to configure. Show: Select YES if you would like your customers to see this block. Number of products to display: How many products should be shown on your storefront? 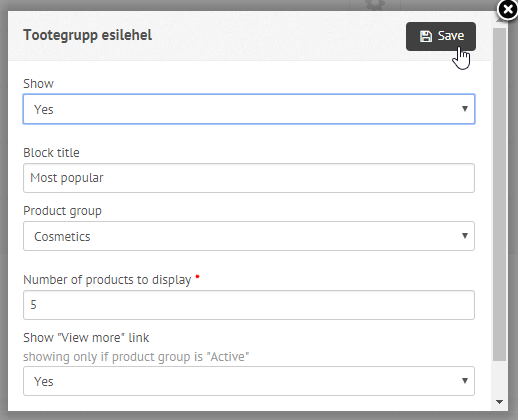 Show "view more" link: Select YES if you would like to enable customers to see more products from the selected group. It has been found that most online shoppers wait to buy a product till it goes on sale. Do these discount hunters a favour and display your discounted products on your homepage! 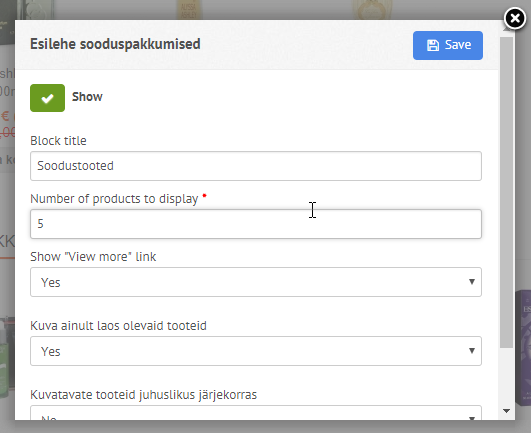 "Kuvatavate tooteid juhuslikus järjekorras": This means "Display products in random order"
NB! 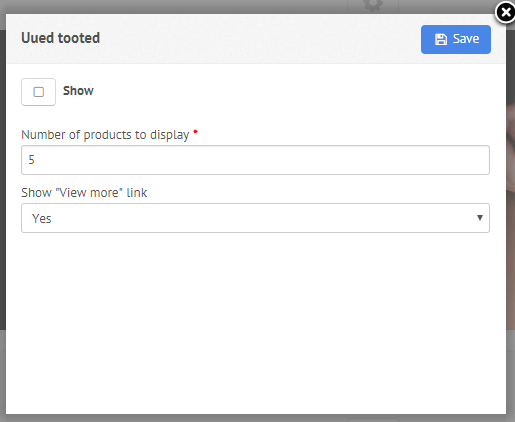 "Tootegrupp" means "Product Group" - we will update it ASAP! Block title: Type the title you would like your customers to see, such as "Daily deals", "Most Popular", etc. Congratulations! 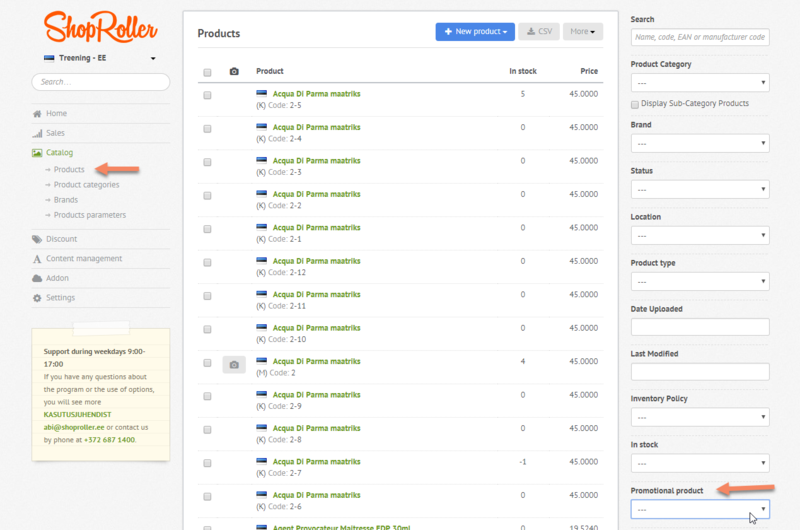 You now have products displayed on your storefront. Here are some frequently asked questions about this topic. I cannot see my "On Sale" products on my homepage. What do I do? Confirm that you have written your desired "number of products to display" - how many products should be shown? 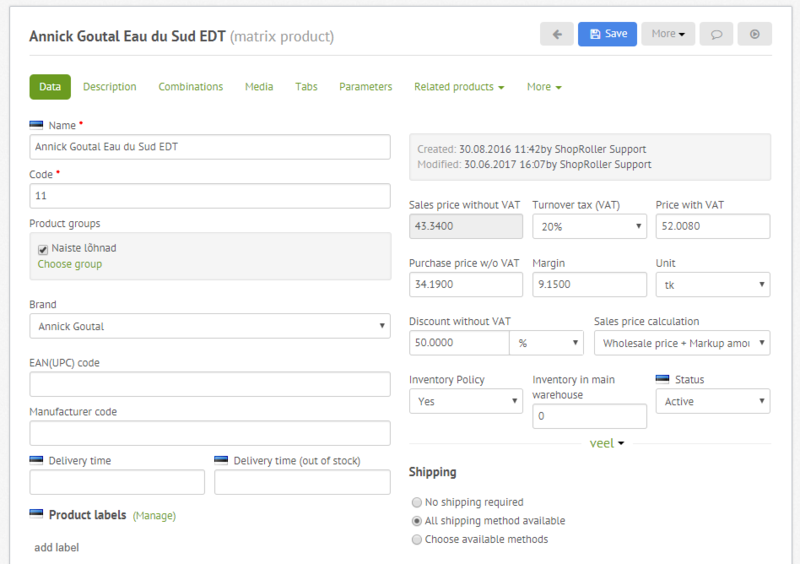 If you have added 5 discount products, but have selected that only 3 discount products are displayed, then only 3 out of the 5 will display. If yes, awesome! Update your settings as required and save. Step 2: Did the Discount Products save correctly? Using the right-column filter, find "Promotional Product" and select "Yes" to view your discount products. Confirm that there are the correct amount of products with discounts. If you have found that you're missing some discount products, go ahead and add them. Solved! You can learn how to add products here, and learn how to add discounts here. Step 3: Are you promoting Matrix Products? If you are offering discount Matrix products (those products which have variations, such as size or colour), then it might not be displayed on your homepage because of some missing settings. Click on a discount matrix product to view the product card: On this product card displayed, we can see that a "discount without VAT" has been added. However, since it is a Matrix Product, we have to check that the individual products have also had the discount added. 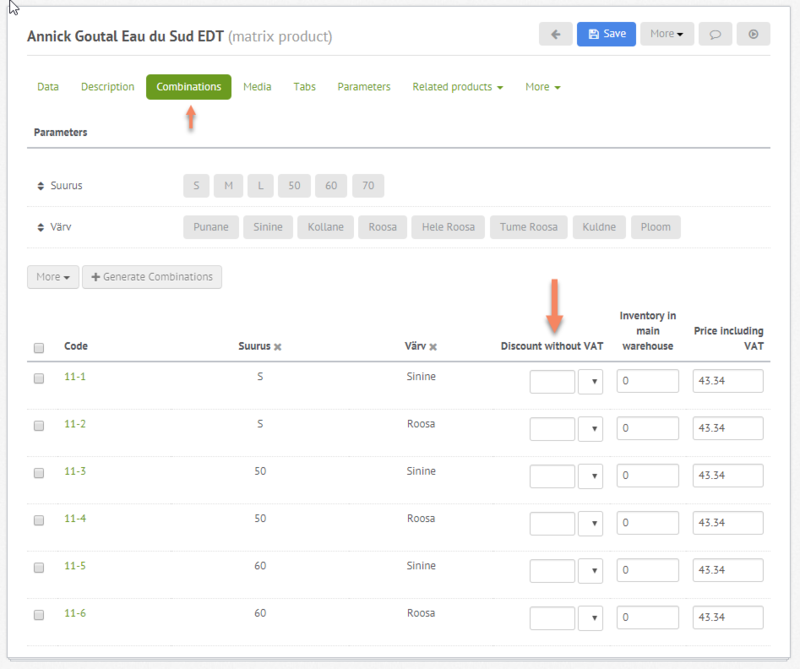 Click "combinations" in the product card menu to view your matrix product variations, and confirm whether a discount has been added: As seen in the image above, this matrix product did not have "discount without VAT" indicated per product variant. Since product variants are considered as individual products, each will require a discount rule included here. If not, send us an email (including screenshots) about your situation, and we will help to figure it out!